"I checked out several driving schools before I finally opted to go with Wigham's. I was really pleased to be actually driving within 20 minutes of first getting in the car. I was given a clear, relevant and practical car familiarisation talk, which allowed me to start so quickly. The friendly, professional instructor introduced new concepts and further practical car knowledge as and when I needed it. This stopped me from feeling overwhelmed by an initial overburdening of information, as friends have experienced with other schools. At the end of each session I was given a clear, concise explanation of the skills I had developed, what I needed to do next and how this related to 'test readiness.' This feedback allowed me to feel in control and motivated, especially as I saw my ratings getting closer to test level. Each lesson built upon the last and introduced new roads and situations so that I became familiar and happy on all road types. From my first lesson, the instructor encouraged me to use materials to practise for the theory element of driver training, and would build in questions during my practical sessions to consolidate this. I was encouraged by my instructor to enter for my practical and theory tests as soon as he felt I was ready and I was never pressured to book lessons that he felt I didn't need. Despite not starting driving lessons until my mid-thirties I was quickly made to feel relaxed and confident behind the wheel. I learned to drive quickly, but confidently and passed my test first time (with no faults) due to the fantastic instruction I had received. I have recommended Wigham's to friends and family and would happily do so to anyone. 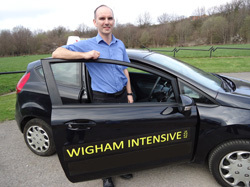 When my children want to start lessons, it will definitely be with Wigham's." "I initially contacted wighams due to the fact they do intensive courses, as I work out of the country for the majority of the year and am only back three or four times a year. With the initial discussion we agreed that I would pass my theory and then contact the instructor I was allocated too to arrange a test and to sort out my lessons. My test was booked for a Saturday and I had lessons for a period of 8 days, having 6 hours a day, 3 hours in the morning and 3 hours in the afternoon. 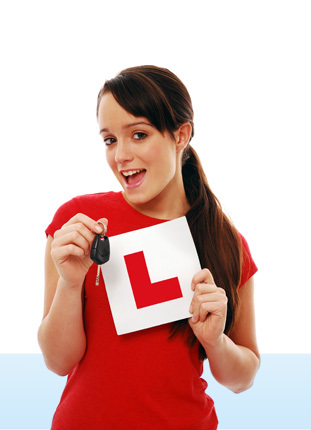 Initially I was a bit nervous of whether that would be too much as I had never driven before, but right from the first lesson all the information I was given was concise and relevant and I was driving within 20 minutes of getting into the driving seat. I was given constant feedback and any mistakes I made were rectified. As I got nearer my test day, we carried out 2 mock tests to show me what the test consisted of, which gave me a good insight to what was expected of me. Although I went into the test quite nervous I also felt confident, as I had all the knowledge and skill to make me a good driver. I passed my test with 2 minor faults and was delighted. 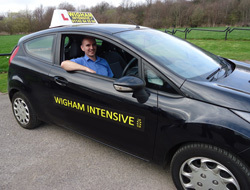 I would definitely recommend Wigham's, whether you want an intensive course or a lesson every week. 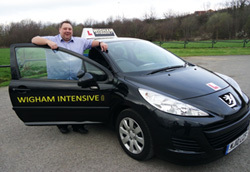 I'm now independent and don't have to rely on others for lifts and that's thanks to the guys at Wigham Intensive." "During the summer of 2011 my husband was taken into hospital and was in for a long period of time. I went to the hospital everyday which took a 2 hour round trip on the bus. My daughter suggested that I used my husband's car to get there as I passed my test 20 years earlier, but had not driven for a few years. I contacted Wigham's and had a long discussion with an instructor on what the best course of action would be. We decided that we would use my husband's car which was an automatic so I could get used to it and it wouldn't feel strange and unfamiliar when I wanted to go in it alone. Over a period of a week I had 4 hours instruction driving on all types of roads, through town and even to the hospital where my husband was so I knew the route and also did some parking. The instruction I was given was very helpful and the instructor provided a calm and relaxed atmosphere which helped greatly. With the help I was given I felt confident and my journey time was cut to a 40 minute round trip. I've continued with driving and am really enjoying getting out and about. I would recommend Wigham Intensive with whatever form of lessons you need and when my grandchildren are old enough I will be contacting them again."